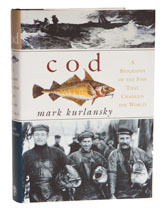 Not many fish get to have a biography, and at first glance, the cod makes an unusual choice - although this book became a runaway best seller and inspired an entire genre. Once so prolific that it could be hauled up in baskets, yet now now this species faces extinction. Quite simply, man has wiped the cod out, and for this reason, Kurlansky’s book, while well written, makes uncomfortable reading. The cod is not alone, because 70% of the species in British waters are being over fished. Elsewhere in the world, the same pattern is being repeated, with the possible exceptions of Norway and Iceland, which have had the sense to establish some kind of stock management. The response of the other cod fishing nations is to dissemble, make useless gestures, and to continue policies which will keep the fishermen off the news until the cod is extinct. To read this book is to get an idea of the scale of our pillage of nature; for example, over fishing of bait fish has resulted in seals relocating and altering their diet to eat other species. The fishermen call for seal culls, the environmental lobby go and hug the beasts, and both sides ignore the real problem, which is that we have devastated the food chain, and are in the process moving in to finish off the last few pockets of resistance. For some reason, fish don’t seem to have many friends; a cod activist is an unbelievable idea, and yet that is exactly what is needed.